Welcome to the world of the hippopotamus! This image allows us a glimpse of the secret life of hippos as they soak in their water hole. A baby hippo rides on his parent's back, while the other looks on watchfully. 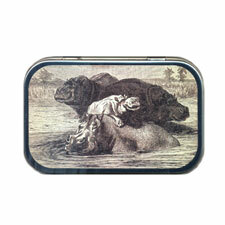 We've taken a vintage hippo illustration and applied it to a new silver colored tin the size and shape of an Altoid mint tin.